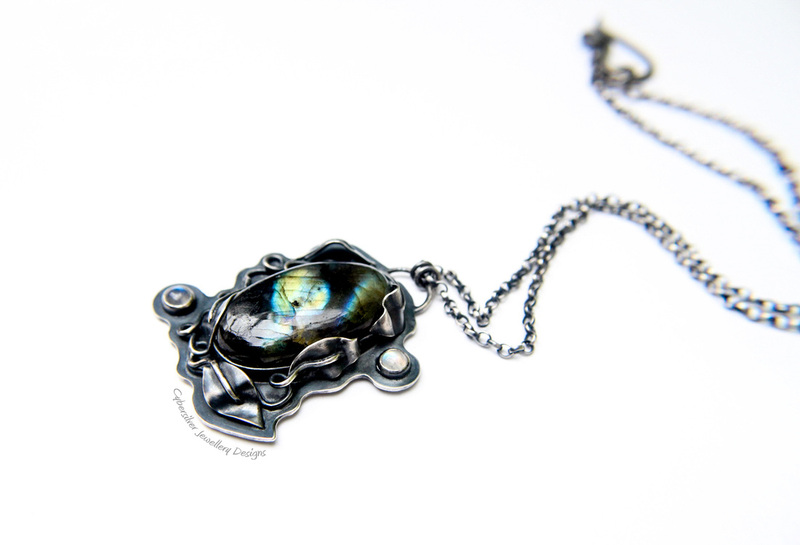 This unique pendant features a large labradorite gemstone and two smaller blue moonstone gemstones. As the light hits it, the labradorite displays the most amazing flashes of yellow-green outlined with 'lightening' flashes of brilliant blue. Each leaf has been hand cut and soldered into position. Three of them caress the stone to hold it in position. The silver has been oxidised and relieved to highlight the design and give a lovely patina. The chain is oxidised to match and then the piece is sealed with a protective wax to help protect the oxidised surface. This is a substantial, one-of-a-kind pendant. Moonstone is a stone for new beginnings - a stone of inner growth and strength. It helps to soothe emotional instability and stress and provide calmness, balance and harmony. It is a stone strongly associated with women and feminine wisdom.